RIVERSIDE, Calif. – Ethan Lopez knocked in six runs including four on a third-inning home run to lift the University of Hawaiʻi baseball team to a 15-3 victory over UC Riverside in Big West action on Saturday at the Riverside Sports Complex. Hawaiʻi (14-18, 4-4 BWC) broke a 2-2 tie with 12 runs in the third inning en route to victory over the Highlanders (10-22, 2-6 BWC). A day after falling by a 16-5 final score, the Rainbow Warriors were able to bounce back with their fourth double-digit scoring effort of the season. UH scored two runs in the top of the first on a single from Lopez, but UC Riverside answered in the bottom of the second with a two-run home run from Connor Cannon to level the scoring at 2-2. From there, UH starting pitcher Cade Smith found his groove, earning the win with a final stat line of 6.0 inning pitched, three earned runs on nine hits to go with five strikeouts. Out of the bullpen, Jeremy Wu-Yelland picked up the save going 3.0 innings with four strikeouts. The lefty allowed just two hits and no runs. The third inning consisted of RBIs for Dallas Duarte, Tyler Best and Maaki Yamazaki before Lopez did his damage with the grand slam. Duarte, Tyler Murray and Best all put up RBIs in their second at bats of the inning to push to the lead to 14-2. UH had 10 hits in the frame. 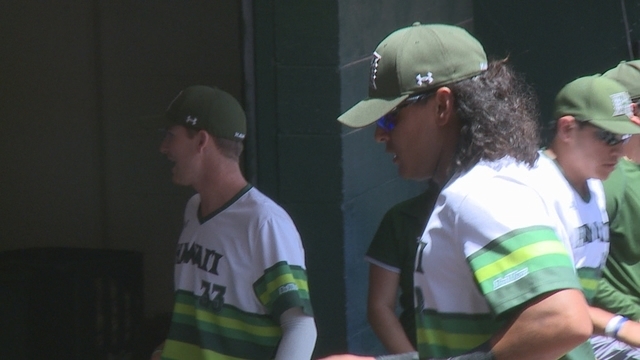 Hawaiʻi added another run in the fourth before the Highlanders capped the scoring with a run in the fifth. Seven different UH batters had multi-hit games on the day. Yamazaki and Calicdan posted four hits apiece with Alex Baeza, Lopez, Brennen Hancock, Murray and Best all tallying two. The Rainbow Warriors outhit the Highlanders, 19-11. The series finale between UH and UC Riverside is slated for Sunday, April 14 in Riverside, Calif. at 1 p.m. PT (10 a.m. HT).